Give two of your best hunting buddies tons of travelling room and stash your hunting gear inside the super-sized drawer of Owens Products Pro Hunter Series Dual-Compartment Dog Box with Bottom Storage. 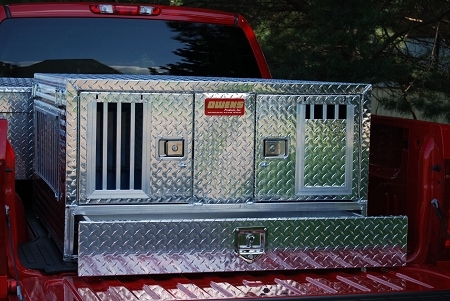 This pro-level dog-transport box boasts aluminum diamond-tread construction and lockable, slam-latch doors. Its dual-lined (top and bottom) dog compartments safely accommodate most hunting dogs. Storm covers and generous four-season ventilation keep your dogs comfortable in all kinds of weather conditions. Made in USA. Dog compartments: 17"H x 19"W x 38"D.
Storage compartment: 5"H x 38"W x 37"D.
Solid construction with quality hardware. Idea box for my hunts. I'm extremely organized and with my new Pro Hunter all items are neatly organized Dog have adequate room for comfort while traveling too. Two thumbs up.